As the weather becomes cooler, we begin to close up the windows and doors and get out our warm clothes to wear. 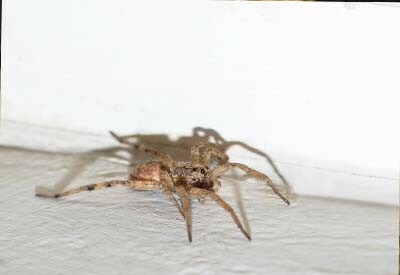 Spiders like to hang out in the corners of your home. Find out how to naturally deter them from entering your home. Because spiders can’t close up their outdoor living environment, and obviously don’t wear clothes, they find their winter time refuge in the warm homes around where they live. Unfortunately, that means we find them hiding in the corners of our rooms and in and under everything that they can find. We know that some spiders are beneficial for insect control, but once they come inside the house, the friendship quickly ends for most of us. In order to make it through the winter months, we try to prevent them from entering our home using natural methods to deter spiders. No harsh chemical sprays, no exterminators, just natural methods to keep our home spider free. Of course each method may not be 100% effective, so we use a combination of these methods each year. Some of the below tactics require using a natural deterrent spray, so before using it on carpet, wood, furniture, etc. you need to test out an area to make sure it is safe for your surface. 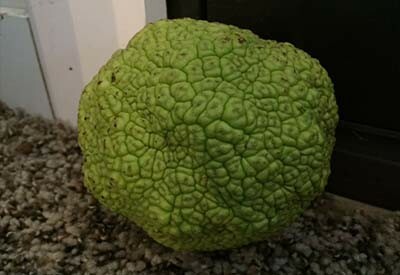 Based on old wives’ tales Hedge Apples placed near doors and on window sills helps deter spiders from entering the home. Although proven to work in only high concentrations, placing Hedge Apples around the outside and/or inside perimeter of your home is a natural method to deter spiders based on old wives’ tales. We use this method each year and notice a significant decrease in spiders in our home. We place them near doors and in rooms/basements that spiders tend to congregate. Place chestnuts outside near doors and windowsills to help protect your house from spiders that want to come inside. 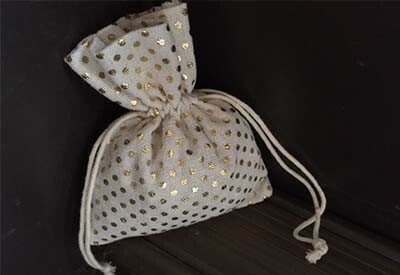 Use Peppermint Essential Oils on ground up corn cobs or cotton balls and place in cloth favor bags around your home. One of our favorite natural methods to deter spiders is with peppermint oil mixed with water. Add 5 drops per cup of heated, but not boiling, water. Allow to cool and place in a glass spray bottle. Apply the repellent along window sills, doors and other locations and areas used by spiders for coming inside the house. Another way to use peppermint essential oil is by dabbing 5-6 drops onto ground up corn cobs or cotton balls, and then placing them in cloth favor bags strategically around your house. We place them by the doors, under cabinets or sinks, and around any cracks and crevices that spiders could enter. Spray the bags with the peppermint/water mixture once a week. Be sure to only use 100% pure peppermint essential oil. Create garlic repellant spray by putting two or three cloves of garlic in a pot of boiling water. Simmer for 10 minutes and allow to cool. Place mixture in a glass spray bottle and spray the outer door frames and window sills once a week. Sprinkle eucalyptus sprigs around the outdoor perimeter of the house to help repel spiders. The spiders do not like the strong smell and will find other locations to hide. The dried seeds of cilantro can be sprinkled in flower beds close to your home. They will also repel spider mites in around your flowers. Add two tablespoons of dish soap into 2 cups of warm water; add 5 drops of tea tree oil and 1 oz. of neem oil. Mix together to incorporate and pour into a spray bottle. Spray areas where you have seen spiders. Peel off your orange (or other citrus fruit) and then cut the peel into small chunks. Place half of the chunks into a medium saucepan and then pour one cup of boiling water over them. Leave them to soak overnight. In the morning, strain the chunks and then add a quarter-cup of witch hazel to the water. Add the mixture to a spray bottle and shake well. Smash up your remaining chunks of orange peel using a pestle to release the citrus scent and then sprinkle those in places like cabinets, under the sink and other areas where spiders frequently enter or are seen. Vinegar has so many natural uses and deterring spiders is just one of them. Add equal parts of vinegar and water in a spray bottle and shake well to combine. Spray it directly on the spiders, their cobwebs and any place you usually find them. Spray in cabinets, closets, corners and window sills. Be sure to get those cracks and crevices in the floor, especially by the doors, and repeat once a week. Sprinkle cinnamon around your home or use a cinnamon spray on pine cones and place them around the inside base of your house. Not only will it keep the spiders away, it makes your house smell amazing! The old wives’ tale states that if you sprinkle it in a line across the spider’s point of entry (door thresholds), they won’t cross it. Here is keeping a friendly relationship with spiders – Outside! To receive our 3 Home, Garden, Recipe and Simple Life articles each week, sign up for our free email list below. You can also follow us on Facebook, Twitter, Pinterest, or Instagram. This article may contain affiliate links. I actually like having the spiders around. For many years I was terrified of large spiders, (like many people I guess). One day I just thought, “This is ridiculous” and picked up the big spider that was in the bath and carefully dropped it out of the window. I didn’t “enjoy it” as such, but I have never been scared since and regularly pick up big ones and put them elsewhere in the house. The amount of ants and other bugs that they dispose of makes them more than welcome in my house. Yes, thank you for catching that for us. I just wipe down window ledges and baseboards with Pine Sol.